I was home alone and a little bored one day. So… I decided to check out a spot I’d driven over on a number of occasions but had never stopped to take a look. That was Davidson Park underneath the eastern side of the Roseville bridge. The Roseville Bridge is a concrete box girder bridge located adjacent to the suburb of Roseville where it crosses Middle Harbour. Truth be told I was just here to check out the place for a potential future shoot here. Or even on the other side of the water in the mangroves there. Later on I also checked that spot as well :). I wasn’t really invested in the shoot and it showed :). Still I managed six (6) long exposure frames in the time I spent at this spot. Unfortunately flare with strong sun hitting the front element killed a few of the frames. The flare was really bad (I could see it in the viewfinder). I did try and shade it with my body and my hat but alas it was difficult. Still this was the first frame I took there. It’s also the one I was most happy with when looking at them in post. It was crying out for a conversion to monochrome. Some manual lens correction to try and fix some of the distortion from tilting the lens upwards and a nice vertical pano crop. 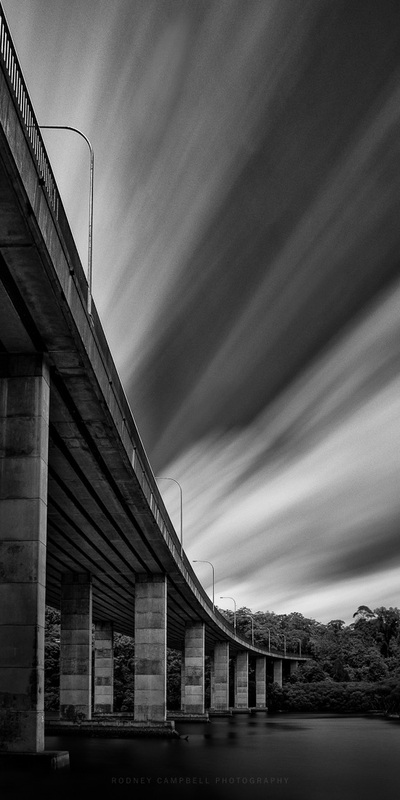 This final result under the Roseville Bridge is a manual blend of two exposures. One long exposure using the Lee BigStopper stacked with a 3 stop ND for most of the frame. The second a shorter 30 second exposure to reveal some details in the shadowed area under the bridge and a better version of the water below.